It’s Fall! Time for fireplaces, blankets and….SMORES! 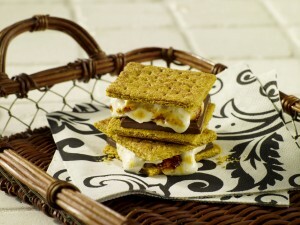 Talk about gourmet S'mores! Try this one on for size! Even though we Arizonans don’t often get to bear witness to the colorful change of seasons or the wintry blast of frigid weather, we do try to keep pace with the cooler states by celebrating our own descent into the 80 degree temperatures by turning down the A/C, brewing that evening cup of hot cocoa and pretending we might actually need a jacket in the mornings! Evening firepits and barbeques begin to light up with more frequency this time of year and S’mores definitely top my families list of necessary fireplace accessories! If you’re looking for something to shake up your typical hot chocolate or S’more dessert, we’ve got a great place to start! 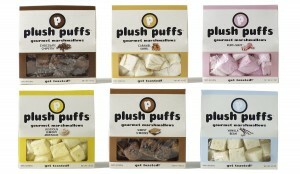 PlushPuffs Gourmet Marshmellows recently sent me some samples for my family to try and while the reviews were mixed, I think it is definitely a worthy product to give a try and possibly add some spice to your wintery desserts! We were sent three samples of the eight flavors offerred. My husband, a consummate fan of the traditional, sampled each one and firmly stated “ew!”. But my kids and my own reactions were quite different. I could not put down the Vanilla Bean marshmallows. They are exceptionally sweet but very light. Due to an unfortunate delivery inconvenience (namely the 100+ degree Phoenix weather that managed to melt most of the samples before I could retrieve them from my doorstep even with cold packs in tow! ), I was not able to have enough of the samples to mix and match in different dessert options to see how they would change the flavors. But I imagine the Vanilla Bean would be exceptional in hot chocolate or as a s’more combination. PlushPuffs come in 8 different flavors. My kids loved the Peppi-mint and Caramel Swirl Marshmallow flavors (even melted, these were not sitting on the counter long!). I would have loved to try the Peppi-mint in a few dessert recipes. One in particular calls for melted marshmallows and white chocolate as a topping for brownies! These marshmallows are exceptionally light and are aptly named. They are different from our regular marshmallows because they are handmade in a two day process and flavored with all-natural ingredients. They are even cut by hand! While you could potentially eat them right out of the bag, my family and I found they are almost too sweet for that and would be better served in recipes (rice krispy treats, S’mores, hot chocolate, etc.). Some of the other flavors offerred include Simply S-mores, Luscious Lemony Meringue, Chocolate Chipetta, Toasted Coconut and Sydney’s Cinnamon. Plush Puffs come in 16-18 one-inch cubes – about 4 oz. for $5.99. You can check them out at their website at www.plushpuffs.com. Happy marshmallow roasting! If you decide to try them out, we’d love to hear what YOU think!…share your thoughts in our forum!